Learn from a veteran research and insight expert how to tackle global customers across different channels, devices, and cultures. 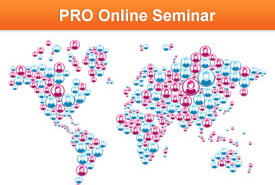 Starting with an overview of global customer experience management, this PRO seminar will teach you three approaches used to develop a strategy for localizing experiences for each geographic area. Not just for global marketers, you'll also learn how customer experience innovation in one market propels a company's competitiveness and growth. Liz High is senior director of professional services and consulting at SDL Social Intelligence. Liz has led a number of social data innovations that have underpinned the original thinking that became the Customer Commitment Framework™. Some of her key projects include the multi-award winning CNNI POWNAR study and the P&G SuperSavvyMe project, which was the first index driven prototype delivered by the team. CXO's and marketing professionals who wish to use customer experience as a driver for growth within their organizations. "Liz is on top of her game - she gets it!" "Great information for startups as well as established enterprises. It will help you realize the importance of developing a consumer experience strategy based on knowledge and making customer experience a priority."